The Empire State of the South: Georgia History in Documents and Essays offers teachers of Georgia history an alternative to the traditional narrative textbook. In this volume, students have the opportunity to read Georgia history rather than reading about Georgia history. 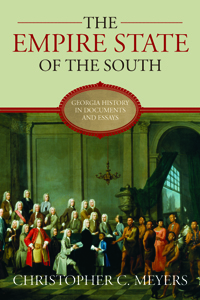 Encompassing the entirety of Georgia history into the twenty-first century, The Empire State of the South is suitable for all courses on Georgia history. This text is divided into 16 chapters comprising 129 documents and 33 essays on various topics of Georgia history. The primary documents represent a wide range of genres, including speeches, newspaper columns, letters, treaties, laws, proclamations, state constitutions, court decisions, and many others. Some documents outline general themes or movements in Georgia history while others address more narrow issues. The thirty-three essays are excerpts from larger pieces that were written by specialists in Georgia history. Each chapter consists of several parts. First is a short narrative introduction. The second part contains the documents themselves. Following the documents are two essays written by historians regarding some topic relevant to the chapter. At the end of each chapter is a short list of suggested readings. The documents themselves range from the usual: state constitutions, laws, and speeches, to the inordinate: plans for constructing what is regarded as the state’s first concrete home, a corny campaign song for Eugene Talmadge, an attempt by the General Assembly in 1897 to ban the playing of football, and a 1962 letter Martin Luther King, Jr. wrote from an Albany prison that preceded his more well-known Birmingham letter. Georgia has indeed had a colorful history and The Empire State of the South tells that story.